I frequently had the problem that downloaded STL files needed some minor editing in order to be printable on my 3D printer. Most of the time it was just a simple move to the center of the build platform or a resize. In addition to that, I already wrote OpenGL code to visualize STL and GCode files a couple of months ago for another larger project. Finally I had sometimes the problem that I downloaded a ASCII encoded STL file and wanted to open the file in my 3D/CAD application. Since this application can only read binary STL files I needed an easy way to convert ASCII STL to binary STL. Integrated a lot of changes from Cyril Chapellier's hackable-devices/Pleasant3D fork. Thanks to Cyril Chapellier, Lawrence Johnston and Maryla! This version implements better error checking in the Quicklook plugins and falls back to displaying the standard document icon if the Quicklook generation fails. That way quicklockd doesn't crash anymore in case of problems. The experimental slice & dice window is now only available if the "Enable experimental slicer/G-Code generator support" is enabled in the application's preferences. It's off by default. Pleasant3D works as a pure STL/Gcode viewer/inspector application in this case (like it was before the introduction of the slicer tool in version 2.0). Fixed a crash in STL Quicklook plugin (GitHub Issue #7, #6, #5). 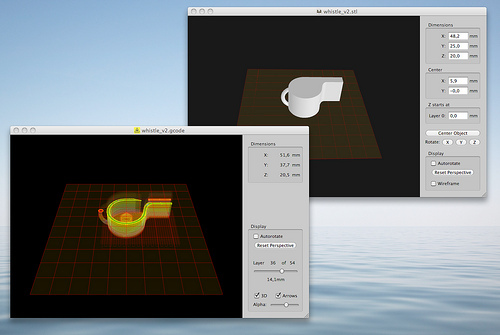 Fixed some issues with the STL and Gcode Quicklook plugins on Lion/Mountain Lion. Fixed an issue with code signing. More intuitive (trackball) view rotation. Panning views with right mouse button drags. Fixed a nasty bug in the STL editor which caused wrong positioning of STL objects in some cases. Fixed some remaining issues with the 64-bit version: Pleasant3D runs now as 64-bit application (if supported by the computer). Automatic check for updates (Sparkle). Pleasant3D now includes QuickLook plugins for STL and GCode files! Use the scroll wheel on your mouse to zoom in/out. Optionally, hold the command key and drag the mouse horizontally. Pan the view by holding the Option key and dragging with the mouse. Since there's no rotating in the GCode 2D view, you don't need to hold the Option key to pan there. New "Rotate" section in STL documents. You can now rotate objects by arbitrary angles. Additional "Factor" field in the "Dimension" section. This might be helpful when resizing multiple files. Keyboard shortcuts for changing the current layer in GCode documents. Press the up arrow key to increase, or the down arrow key to decrease the current layer. Press Option-up arrow to jump to the last layer or Option-down arrow to jump to the first layer. The last known state for "Autorotate", "Show Arrows", "Alpha" etc. are now saved in the preferences. Pleasant3D requires Mac OS X 10.7 (Lion) or newer. Pleasant3D is now open source!